The family architecture firm of C. Bruijnzeel & Zonen was responsible for a number of private houses in this part of Kralingen. One of the 'sons' in the firm's name is the famous kitchen producer Bruijnzeel. 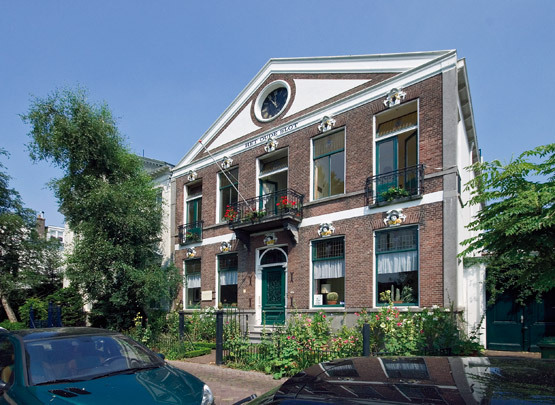 As architects they wielded diverse styles as can be seen in the houses at Voorschoterlaan 44, 46 and 54 and Essenlaan 12-24. The two broad houses on Slotlaan have pediments extending the full width. The entrance gate to no. 29 includes a leaded window depicting Honingen, the castle that used to stand here. This house is called Het Oude Slot ('the old castle'). Het Nieuwe Slot next door at no. 31, which was altered in about 1910, has six colossal pilasters and exotic and fanciful decorations including sea monsters and bunches of grapes.